Auburn commuters can expect partial lane closures beginning mid-July as construction of the five-story, 600-space South College Street Parking Deck begins on College Street between Roosevelt Drive and the main entrance to The Hotel at Auburn University and Dixon Conference Center. The parking deck will be constructed in the existing surface parking lot south of the hotel. This project will take place in three stages. Closure of the south parking lot. Closure of the adjacent sidewalk and two northbound lanes from Roosevelt Avenue to the entrance of the hotel. Relocation of utilities from the south lot into the South College Street right-of-way. During first stage, both northbound lanes will be reduced to one lane and shifted into the current center turn lane. Reopening of the two northbound lanes to allow for football traffic to travel downtown. The sidewalk will remain closed. Construction of the parking deck will continue in the south lot. No road closures will take place during the second phase. Completion of the parking deck in the south lot. Construction of new steps and ADA access to the south side of the hotel. During this last stage, lane closures can be expected, but planned lane shifts will allow for traffic to flow at all times. A new 14-foot-wide sidewalk from Roosevelt to the hotel entrance. Parallel on-street parking in front of the parking deck. Installation of a streetscape median in front of the new deck. A mid-block crossing with a flashing beacon. New steps and ADA ramp on the south side entrance to the conference center. 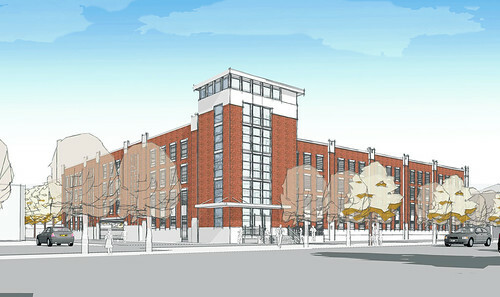 The Auburn University Board of Trustees approved construction of the South College Street Parking Deck during its April meeting. Work on the streetscape and crosswalk has been a collaboration with the City of Auburn which is helping to fund the street work. A map detailing the project can be found on the Facilities Management Temporary Road and Facilities Closures page. A rendering and additional details about the project can be found on the Facilities Management Major Construction Projects South College Street Parking Deck page. Shown is a rendering of the parking deck that will be constructed in the existing surface parking lot south of The Hotel at Auburn University and Dixon Conference Center.